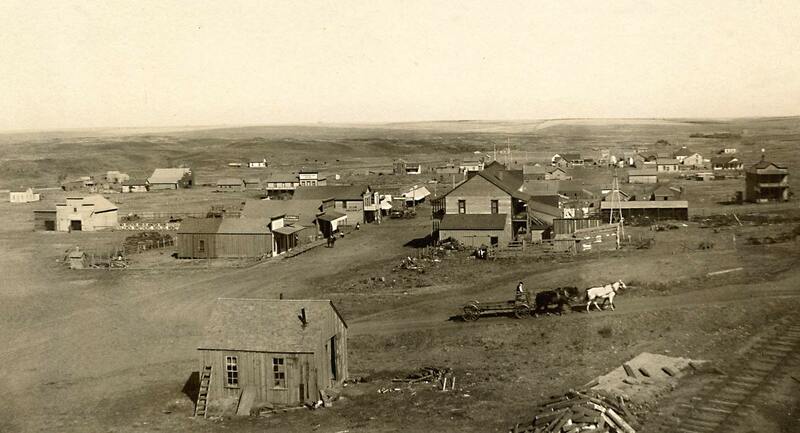 Back in 1880, Lincoln County was known only as "a howling desert". However, the Harrington, Furth, & Robinson firm saw that the soil was fertile and could be used for farming. So in 1882 they bought the land that would later make up the town of Harrington. It was in the same year that the Northern Pacific Railway Company looked into stretching their rail lines through the area. In honor of W.P. Harrington, this land was given the name "Harrington". One year later people first inhabited the town. The first store was opened by Edward Willis and Charles Billings. The next year, the post office was opened by Edward Willis who assumed the role of the first post master. Soon after in 1884, the black smith shop and the Pickell Hotel were established and two years later, the first saloon opened. In 1892, the farming community had its first grain bins that came along with the Great Northern Railway Company tracks running down the middle of town. Within the next two years, the town grew as the railroad continued construction on its railways. Then the Hotel Harrington opened (now the site of the Bank Block Building.) 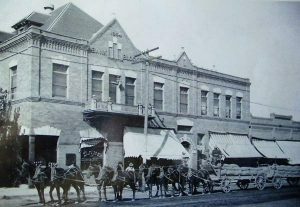 The main street was established and made the city come more alive, and there was a two- room school house built, along with a drug store, stables, meat market, barber shop, two hotels, four general merchandise stores, drug store, bank, and furniture stores. 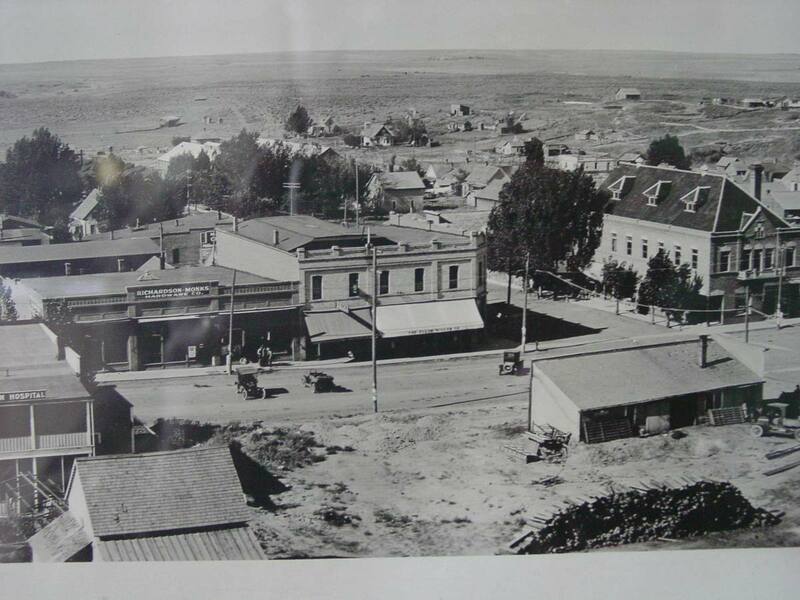 By the year of 1890, the town was booming! In 1897 the grain crop was the best it had ever been which marked the end of a five year depression. But still, grain prices were very low. The early 1900's building boom began with the construction of the Harrington Milling Company. In 1901 the city established its first government and the mayor was A.C. Billings. The first city hall was built and the town began to grow until it reached a zenith of 850 people. In 1901, the Portland Milling Company purchased the mill. With C.D. Ellis as the manager, the mill increased capacity to 325 barrels per day. And it turned out a breakfast food known as "Morning Glory." After the milling company, the Gordon, Throop & Company's draper factory and machine shop was the next most important manufacturing enterprise. The plant eventually became the Harrington Manufacturing Company which produced Harrington Harvesters. These hillside machines with a leveling device were shipped all over the North West via rail. The Bank Block building, erected in 1904, housed the Bank of Harrington, The Opera House, a barber shop, saloon, and lodging for tenants. Today this building houses the Harrington City offices and library. The Opera House; portion is currently being restored by local volunteers. In 1914 a new school was built to replace the old one. In 1916, the telephone and telegraph arrived and the city of Harrington built a camp for tourists. In 1920, wheat prices were down, crops were poor, and the farmers struggled with the beginning of the depression. The crops improved but wheat prices stayed down in 1923. The city began to grow smaller. Odessa Union Warehouse purchased the Harrington Milling Company, later converting the mill into a bulk grain elevator. In 1923 the Harrington Harvester Company was lost in the largest most disastrous fire in Harrington's history. In 1925 first Harrington Day was celebrated. Conceived by W.B. Armstrong, it became an official event and the largest mule show in the United States. 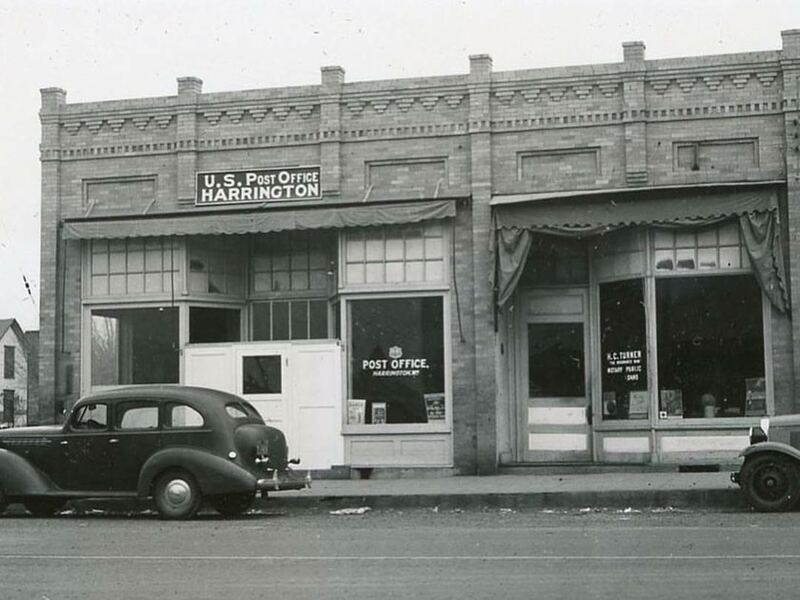 The Harrington State Bank, in the Bank Block building, was the only bank to survive the depression. Eventually, Harrington State Bank was bought by Old National Bank and later moved to the former First National Bank building at its current location of Third and Main. In 1938 Harrington built its first water tower for the price of $10,450. Parts of the original tower still stand today with modifications after World War II had ended. In 1949, Harrington built a new grade school, still in use today, but with many modifications. The "new" high school was built and connected to the grade school in 1955. Ten years later awareness was made to the city for the need of growth. The city built the tennis courts and also the golf course which is one of the best 9 hole courses in the state. On May 18, 1980 the city of Harrington was in chaos because of the eruption of Mt. Saint Helens. It immobilized Harrington. But good came out of it as the moisture sealing ash layer was good for the crops creating a record harvest. Today, Harrington remains connected to its agricultural heritage. With modern transportation and technology, residents are just a click or short drive away from urban conveniences. With a population of 407, K - 12 school enrollment that hovers around 100 students, and essential small businesses; Harrington remains a friendly and viable community.